I come from a country that was communist for a long time. My parents used to tell me stories about how when they were younger they would go to the supermarket and have nothing to choose from. There would only ever be three products – milk, bananas, bread – and just one version of each. If you wanted to buy a pair of jeans, there was the same blue ill-fitting type everywhere. I remember listening to those stories as a kid and thinking “God, that must have been awful”. But at that time, there was No Paradox of Choice. Now, scarcely 25 years after my parents had so little choice, we live in a world at the opposite extreme. The abundance of choice I see everywhere makes me react differently to these stories. They no longer seem so limiting: in fact, they sound liberating. How? Why? Read on. It’s Friday. Black Friday, to be specific. You have just finished work and are excited about going to buy a new suit–if only to make your boss finally stop asking if you borrowed yours from your dad. You’ve spent the whole lunchbreak looking online in anticipation. You have given yourself 2 hours for shopping before you meet Alice, your Tinder date. You enter the mall, and you are faced with your first decision—do you go to Zegna or Armani? You decide to go to the department store where you can browse all of the brands in the same place, but the array of brands quickly becomes overwhelming. You head over to the Hugo Boss stand and try to focus on the shirt first. White or Blue? White. White with stripes or no stripes? No stripes. Pocket or no pocket? No pocket. Woah! 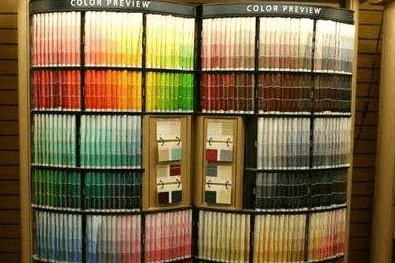 Easy…until you head over to the tie section and even though you know you want a simple blue tie you are confronted with 10 shades of blue and 50 shades of confusion. You look at your watch and it’s already 7:30, and you feel the pressure to choose building. You need to hurry up, but your decision isn’t becoming any easier. You pick the third tie (because it’s your favourite number) and decide to leave off buying the suit for another day. Your shopping trip is over. You leave with a shirt and tie but no suit, and you’re now late for your date. Meanwhile, Alice is on her way to the restaurant. She couldn’t decide whether to wear heels or flats or any of her other 10 pair of shoes, so she took one of the pairs in her purse. She’s in the taxi now, on her way to meet Luke, who’s just texted her that he’s running late. With 20 minutes to kill, she takes out her phone and opens the Tinder app. Before she knows it, she’s already swiping right. Yes, you’ve got it—she’s on her way to her date and is still looking for other potential partners. After all, how can you know that there isn’t anyone better for you out there when you haven’t researched all of your options? He is late for the first date—not a good sign. Does More Choice Equal Freedom? In our modern, capitalist day and age, the availability of choice is seen as the triumph of freedom! (Insert Mel Gibson voice, à la Braveheart). They associate it with autonomy, free will and self-determination. However, the same freedom that makes us free has the potential to overwhelm us. Especially if we are maximizers, people who are only satisfied with the very best, rather than satisfiers, or people who can get along with ‘good enough’. So why does too much choice have the potential to be overwhelming? 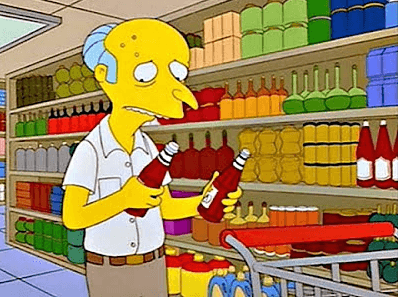 According to Barry Schwartz, the founding father of the Paradox of Choice, there are three main reasons: more cognitive costs, more choice deferral, and more post-purchase regret. 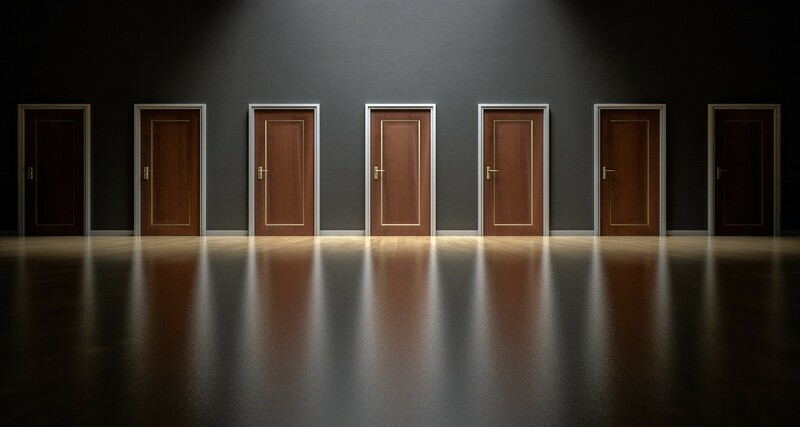 The Paradox of Choice is a theory initially proposed by the American psychologist, Barry Schwartz in his book The Paradox of Choice, published in 2004. Since then it has sparked much heated discussion and debate. Whilst there are published articles which portray it as a stressor added to our lives, there are also articles that refute it and maintain that in the majority of cases increased choice is actually beneficial. This article will aim to present the case for each side of the argument. It will draw your attention to the fact that 2018 will be the year of AI, which will allow sellers to know their customers to an unprecedented level. 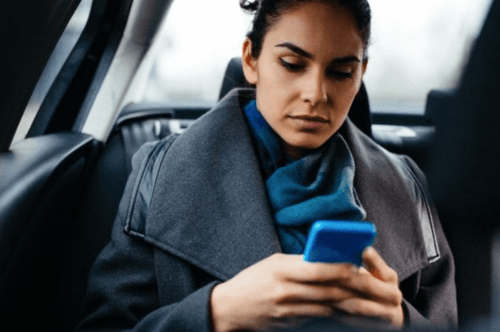 This is important because it will allow for more innovative ways for marketers to position their products and reduce their customers’ cognitive strain. Finally, taking a status quo standpoint, the article will acknowledge the existence of the phenomenon of Paradox of Choice and offer some practical guidance on how online marketers can address it and offer a more persuasive consumer experience. The first reason originates in a famous psychological experiment conducted by George Miller in the 1960s. Miller published a hugely influential paper which maintains that people are limited to only processing only 7 items (plus or minus two) at any given time. This means that in the last decade or so, as the availability of choice has grown exponentially, people’s ability to process information has remained static. If humans can process only 7 items at a time, when we are presented with more we feel overwhelmed. To cope with this, we begin to rely on heuristics and cognitive biases to make decisions. In other words, we no longer make rational decisions. In the words of Daniel Kahneman, we allow our “System 1” to take over. This means that when a customer walks into a retail shop and is confronted with too much choice, the process of making a decision becomes too difficult, which often leads to a “deferral of choice” or a postponed purchase – something that no salesman should want. 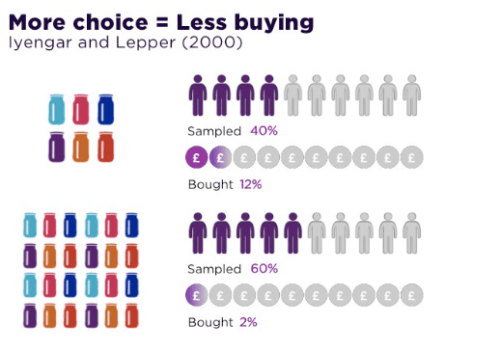 In a famous example, Iyengar and Lepper (2000) carried out an experiment in which they set up a “free sample” table at a grocery store and presented customers with either 6 or 24 jam flavours. They found that when presented just 6 options, 30% of people made a purchase, compared to just 3% who made a decision when confronted with 24 options. In a similar experiment, Procter and Gamble found that decreasing available choice of any given product leads to a 10% revenue increase. Less choice takes the cognitive load off and helps us to act quicker. Feeling overwhelmed by number of potential options often leads to inertia. A study by Schwartz found that there are now more than 156 retirement plans to choose from in the States. The responsibility for choosing is also passed down from the employer to the employee. But how is one meant to choose from so many options? Where do you find the time to research them all? Who feels competent enough to make such a choice? At the same time, choosing how best to save for your older days is not a decision that should be made with your eyes closed! Situations like this often lead to an inability to make any decisions at all. In the long run, this leads to even more dissatisfaction as we start saving later than we should have and end up losing money overall. Logically, more choice should lead to more action and more happiness. Paradoxically, however, more choice leads to less action and less happiness. This is the essence of the Paradox of Choice. In his book, The Paradox of Choice, psychologist Barry Schwartz claims that more choice leads to more stress, more and anxiety, and in certain cases, even clinical depression. But does the Paradox of Choice really exist? Indeed, if we discredited every theory on the grounds that there are cases in which the opposite effect is found then we would not get very far, especially in the field of psychology. Psychology is the science of the most diversely opinionated species on the planet—humans—and generalizations should always be made with great caution. Moreover, the samples that we often use are highly biased as they are often based on WEIRD people: humans hailing from Western, Educated, Industrialized, Rich and Democratic societies. This is only a tiny slice of the human population that is not always an accurate representation. And yet, it is where most of where our conclusions are drawn from. Acknowledging the studies that show the potential benefits of variety of choice does not, however, discredit the theory. It does imply that its effects are highly contextualized. Of course, there will be cases when choice overload does not occur and people who would not be affected. But there still will be cases, a lot of them in fact, when there more choice will lead to decrease in motivation and post-purchase satisfaction. The best arbiter to go to when considering the validity and reliability of a theory is one’s own life. How do you feel when you go to pick a cereal for your breakfast and have 273 options in front of you? Or have to pick the right shampoo for your hair type? Are you sure you’re spending your life with the right partner? Is your next vacation as cheap as it can be? Why did you not pursue your dream job? I, for one, know that the array of options and choices very often make me feel lost and helpless. Rather than being satisfied and committed to what I have, I am constantly afraid of missing out. What does this result in? Inaction and unhappiness. Whenever there is a prevailing theory, there is always something to counter it. But when you don’t trust the science, take a look at the lab of your own mind. Where good entrepreneurs see obstacles, great entrepreneurs see opportunities. Since overwhelming choice can make the lives of modern consumers more difficult, it is a problem that demands action from retailers, marketers, and psychologists, opening up an area for collaboration. 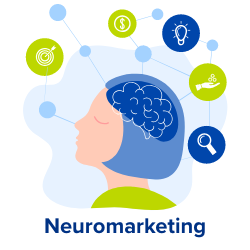 Let’s see how insights from Consumer Psychology and neuro-marketing can be used to address the negative impact of too much choice and offer a more persuasive customer experience. As described above, the main reason choice is making us more miserable is because we have limited cognitive resources such as time, attention span and cognitive load that we can dedicate to making a decision. How can online marketers make it easier for customers to choose and subsequently make a purchase? Solution 1: Make product filtering key. While choice in some shops can be overwhelming, the virtual choice is limitless. Customer anxiety can be alleviated if consumers are more easily guided to the best decisions for them. One way in which this could be achieved is through product filtering. This a well-known strategy efficiently used by many websites such as Amazon, Booking.com, Zalandoo and many others. Solution 2: Be your customer’s personal shopper. With recent technological developments and the rise of AI, marketers know more about their customers than ever before with increased have access to their browsing history and frequent purchases. 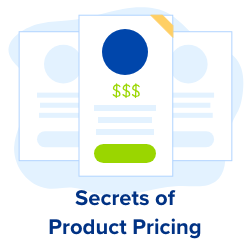 This knowledge could be used to make effective product recommendations and spot-on deal offers. 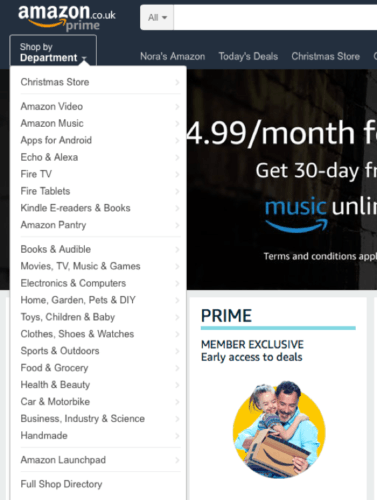 This can serve as a further incentive for people to shop at your site, because the more they do, the bigger their purchasing history becomes and the more accurate their product suggestions. You want your customers to be engaged in a virtuous cycle of purchases and ever more targeted recommendations. Solution 3: Use social influence to suggest products. Humans are the most social species on the planet – when we are not sure what the most appropriate behaviour is, we imitate those around us. 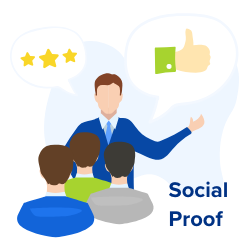 The tactic of harnessing social influence involves presenting information to your customers about what others are doing, thus helps them to see what is the best choice that they can make. 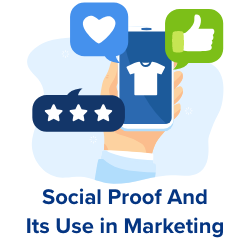 This can be achieved by including notification such as “99 other people are looking at this”, or superlative labels such as “award winning,” to distinguish some products from myriad others. Your CTA should be clear and lead directly to your conversion funnel. 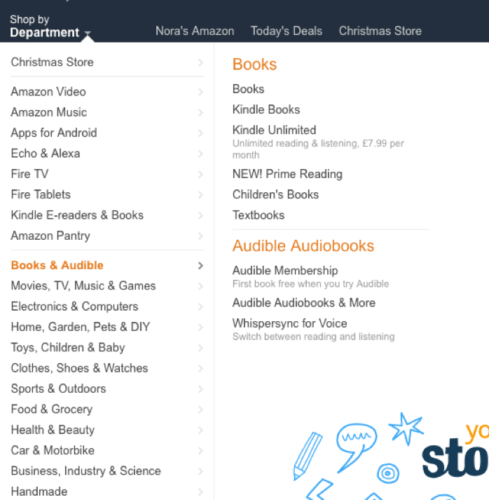 You should have options of “buy the product” or… “buy the product”. Loss aversion, also known as pain of paying, is another cognitive bias which can be used to persuade your customers to take action. Loss aversion simply means that losses seem larger that proportional gains – losing £5 is seen as more painful than the pleasure of gaining £5. 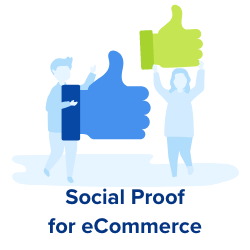 By including notifications such as “best price guarantee” and “price at its lowest” you will reduce the pain of paying that your customers experience, hence increasing the chance of purchase. Scarcity is another highly effective tactic. It works by limiting quantity rather than time. It is a simple psychological principle at work – when there is lots of something, nobody wants it; when there is not enough, everybody does. Telling your customers that there is only 1 copy of this book left in stock, might provoke a decision that would otherwise be delayed. By doing this, your customers are less likely to feel a) as if they have made the wrong choice, and b) as if the responsibility is entirely theirs. You can read more on our blog about Ecommerce optimisation or discover 16 paradox of choice conversion tactics then implement them on your website and AB test in minutes with Convertize SmartEditor™. We have reached a point where too much choice feels more limiting than liberating, and that is why those times when choice was less and life was simpler seem more appealing. But how can we get the best of both worlds? This article has aimed to describe tactical changes in the way choice is presented, thereby preserving its much valued freedom whilst reducing its cognitive strain on your customers. Understanding the psychology behind our purchasing behaviour and the cognitive biases which often rule us is key to offering a more persuasive and pleasant experience for your customers. Let’s help them find the kind of jeans, that used to be the only kind. Nora is an Assistant Marketing Manager at Convertize. She is passionate about applying psychology to business. 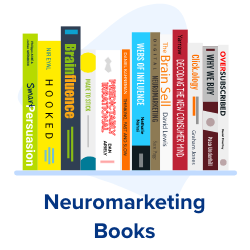 Nora writes about psychology and marketing.